raja and rani: Afternoon Tea, Anyone? Forget The Savoy, one of my favourite afternoon teas in London has to be Pret A Portea at The Berkeley. 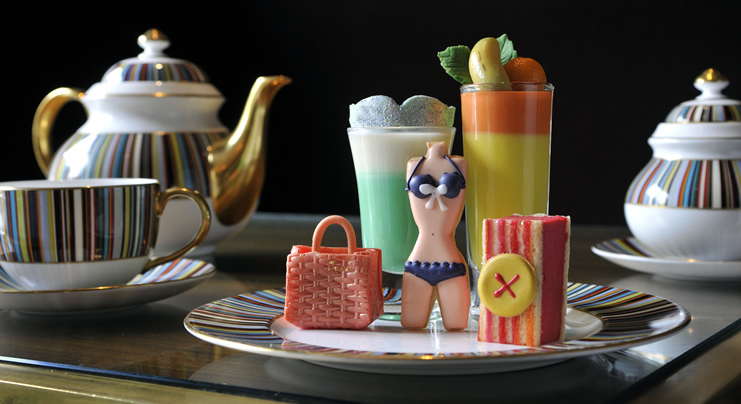 Here you can sip tea from Paul Smith bone china cups and indulge your sweet tooth with cakes and biscuits inspired by the season's catwalk trends. To showcase this summer’s latest fashions, The Berkeley hotel has created an edible collection of designer treats such as Miu Miu ginger biscuit bikinis with vanilla bow icing, Victoria Beckham white chocolate summer bags and Tom Ford romantic pale pink vanilla biscuit dress with sparkly sleeves. For some, this afternoon tea is purely reserved for special occasions (like our wedding anniversary last year!). I am still drooling thinking about the 3 tiered cake stand stacked full of designer pastries and cakes, miniature savoury skewers and delicately cut sandwiches. And just as we’d eaten the lot, the cake stand was taken away and came back filled with even more goodies. And for those tea lovers, there’s a selection of over ten different teas such as White Peony, Organic Assam and African Amber. And champagne of course! If you don’t manage to finish everything (and I made sure I didn’t!) you can take the goodies home in a lovely mint green doggie bag. So if you’ve looking for a treat and an afternoon to indulge in luxury, head to The Berkeley right now!